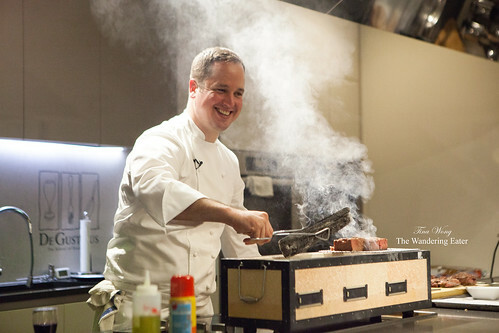 Two nights ago, the cool guys of Betony, Executive Chef Bryce Shuman and General Manager Eamon Rockey, were cooking dinner and holding a cooking demo at DeGustibus Cooking School found within Macy’s Herald Square in Manhattan. Chef Shuman was formerly at Eleven Madison Park (here’s a group photo of the kitchen crew back then when I dined and met Bryce nearly 2 years ago) and Eamon Rockey recently worked at Aska and prior to that a few years ago, a captain at Eleven Madison Park. As for DeGustibus, it is a recreational cooking school founded in 1980 Arlene Feltman Sailhac. It is now owned and run by Salvatore Rizzo, former Director of House Operations and Events at the James Beard Foundation. 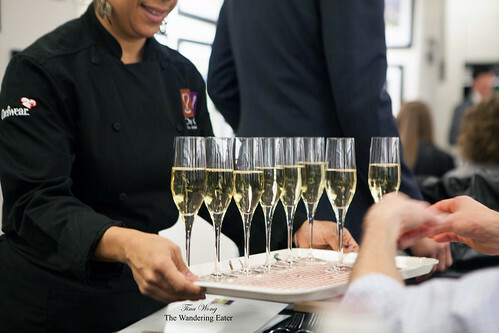 The school invites established chefs, rising star chefs, and sommeliers to serve and interact with food and wine enthusiasts. 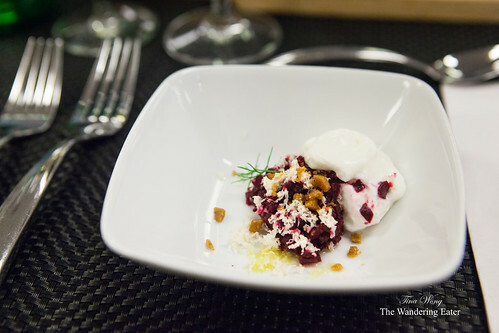 The amuse was a refreshing, earthy, sweet, beets dish with grated horseradish lightened up with goat’s milk foam. 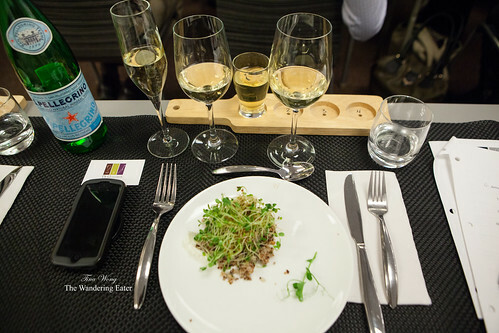 It worked very well with both sparkling wines but the second was a better pairing as the bubbles and acidity isn’t as sharp on the palate. 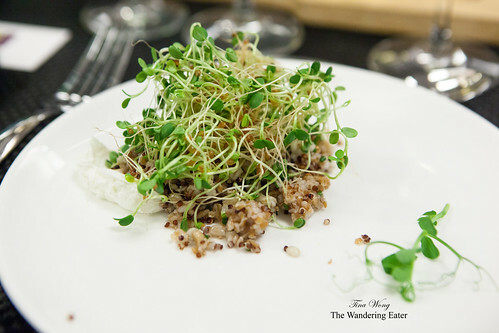 When Bryce was demonstrating his first course of toasted grain salad with labne and sprouts, he deemed this as the most underrated item on his menu just because it seems no would ever think to love this grain salad. He proved all of us wrong and shocked us in the best way that his toasted grain salad is simply awesome. Even my friend who went with me (and not a vegetable lover), cleaned that plate. Though there’s some work needed to boil the grains (quinoa, pearl barley, bulgur wehat, farro, and wheat berries) individually, drain them, and fry them. Serve it with dehydrated grains, salt, thick Greek yogurt, and fresh sprouts, it makes sense there’s so many varied textures of chewy, crunchy, and creamy. The tart and herbaceous breath when you get a small forkful of sprouts and yogurt with the grains, it’s vegetarian heaven. The beer milk punch served with the toasted grain salad was pretty darn good and does pack a wallop. Eamon informed us that making his milk punch is relatively easy but it’s an experimentation. Essentially, it’s a mixture of Assam tea, lemon juice, IPA beer, simple syrup, heated whole milk, vodka and a brown spirit (e.g. bourbon or whiskey) to mix. 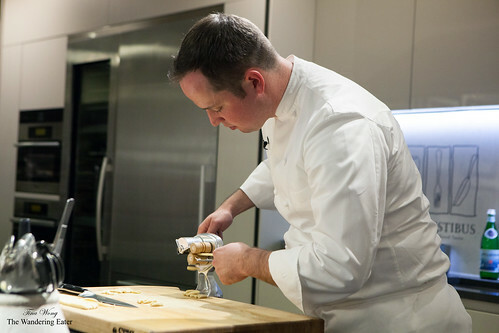 Since Bryce and his team realized they are running short on time, they demonstrated the important parts of each dish. 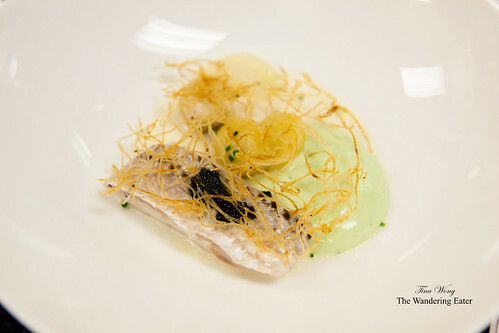 The poached striped bass with celery and potato rosti was a great, delicate fish dish. The bass was cooked perfectly (it was cooked sous vide) and the not too pungent, pastel green celery foam worked well with the light-bodied, flavorful fumet blanc. The delicate web of potato rösti added just enough crunch. The beverage pairing was surprisingly non-alcoholic. They served us a bitter almond, celery genmaicha tea that tied with the delicate flavors of the fish. Eamon mentioned they want to introduce a better tea program since tea is around for a couple millennia and not everyone would want to drink alcohol with their food. Progressing on, Bryce demonstrated how to make the cavatelli by hand and told us a charming anecdote of one of the former chefs he worked with many years ago that he had to knead the pasta dough for at least ten minutes. (The concept of kneading it that long is to have the flour absorbing the water and forming enough gluten structure.) Then he cut them into thick strips and broke out the hand cranked cavatelli maker to churn out these small shell-like pastas. 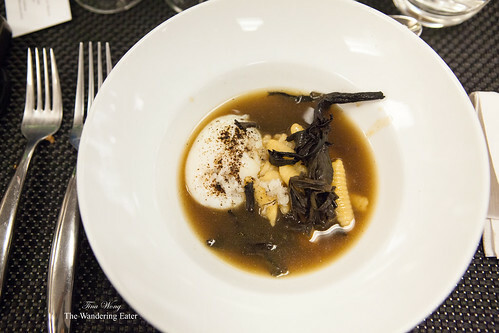 The pasta will be incorporated into a mushroom-based stock and dashi, flavored with black allium oil, and black trumpet purée, a 60-degree poached egg (yes, he used the immersion circulator) and topped with black trumpet mushroom. Oh, this was (upscale) comfort food for me and it was perfect for that chilly evening. 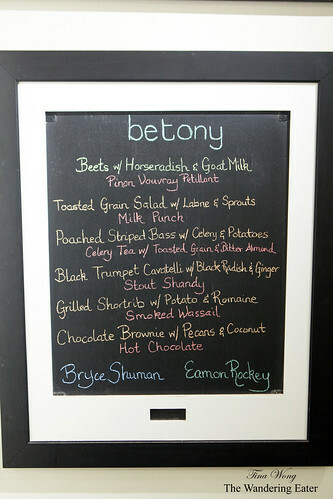 The beverage paired with this dish was the stout shandy. This particular drink was my favorite of the night as it’s sweet (the honey with the Porter beer) but was offset with a subtle spice note and acid (cracked black pepper and sherry vinegar). I need to make this for one of my dinner parties. My favorite dish of the night was the Pat LaFrieda sourced shortribs that was sublimely aged and marbled. What he did was to season and cryovac the shortribs with thyme, garlic, aged beef fat, salt and black pepper then sous vide it for 48 hours at 58°C. 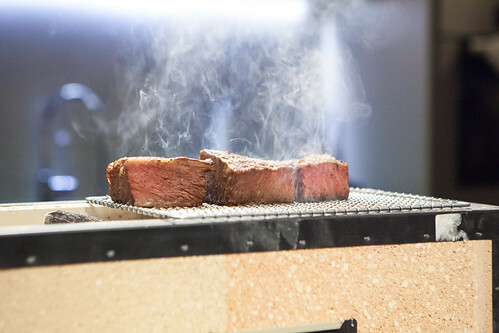 When it’s ready, the shortribs gets finished in a binchōtan charcoal grill to get the clean smoky flavors infused to that intensely flavored cut of beef. 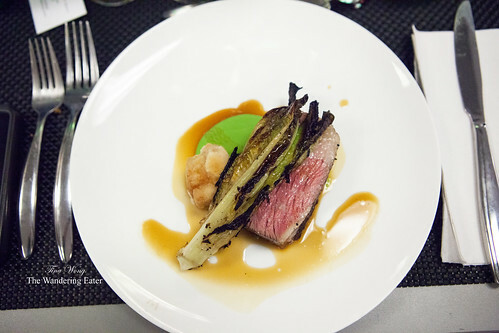 The shortribs was plated with a cube of veal sweetbreads, lettuce-potato purée, aged beef fat, beef sauce, and a few fresh leaves of hearts of romaine. The intensely beefy, meaty, smoky bites of shortribs and creamy sweetbreads with fresh, crunchy bites of lettuce…words cannot express how good this was. This dish was paired with a barley wassail. It’s basically a mulled wine but has a nutty, earthy depth from the barley infused. In case we didn’t have enough food, they cranked out dessert. 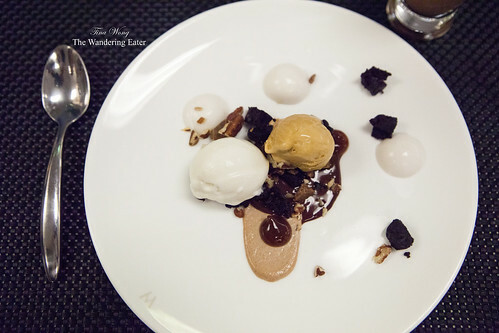 The inspiration is the chocolate brownie but modernized by having cubes of brownies, a liquid nitro caramel and coconut ice creams, chewy coconut custard (the small white hemispheres on the plate), chocolate gel, pecan butter, pecan praline, and chocolate ganache. This was a fudge-y brownie sundae lover’s dessert. 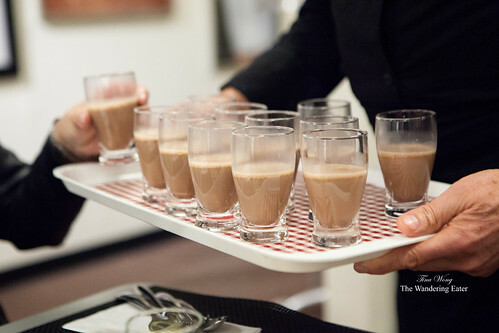 To add more chocolate-y goodness on top of that dessert, they served hot chocolate that’s tinged with molasses to tame the sweetness. A good, non-alcoholic nightcap. Bryce, Eamon, a few of the chefs of Betony and the staff of DeGustibus did a great showing of pushing out the ambitious five courses and an amuse (in about 3 hours rather than the scheduled 2.5) with five beverage pairings without any major flaws. 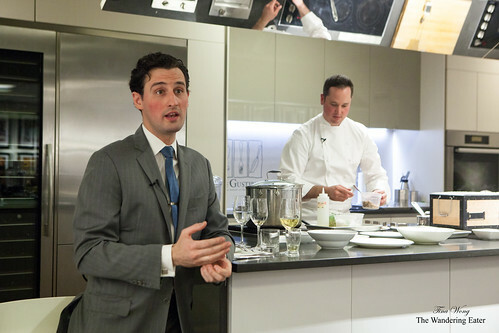 It was an entertaining, delicious evening – and a bargain for $95 per person to attend this class. For me, it’s a pleasure to see the men of Betony grow over the few years we’ve met and I’m definitely planning on dining at Betony soon. As for DeGustibus, I need to figure out which cooking class I can attend.